A few weeks back John and I went to my sister’s house for dinner. We can all agree on Mexican food, so taco salads it was. Salsa and sour cream are obvious toppings for traditional taco salads, but for something dairy-free I went with a creamy cilantro-lime dressing that I made up on the spot. It was so good I was inspired to make this recipe and douse it in the stuff. Green gold, I call it. If you’re in the market for a satisfying vegan and gluten free appetizer or entree, this is the recipe for you. 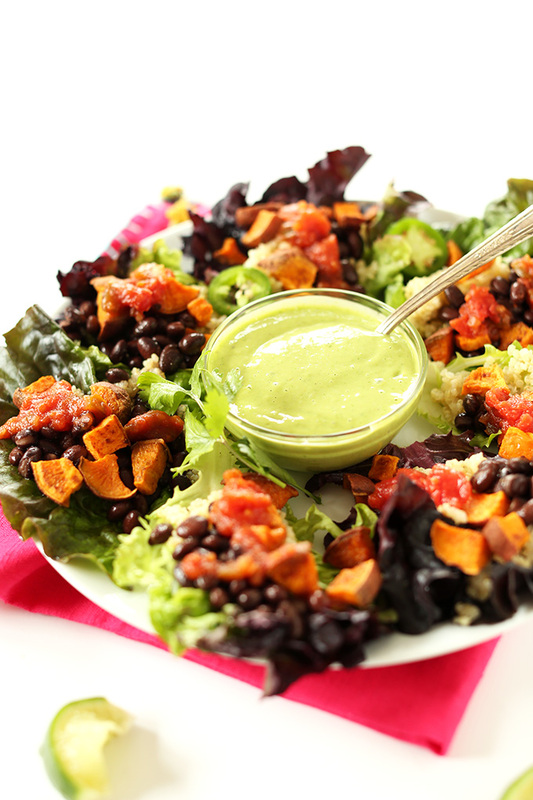 While your sweet potatoes and quinoa are cooking, whip up your dressing! It requires just 6 ingredients and is SO creamy and flavorful. Avocado provides plenty of healthy fat, fiber and a little protein, and makes the texture super creamy. Flavor comes from sea salt, lime juice, cumin, agave and cilantro. Olive oil adds more healthy fat and a velvety finish. This stuff is so dang good, and it makes about 1 cup worth! So keep leftovers in a jar for other salads and Mexican dishes throughout the week. Next comes assembly! 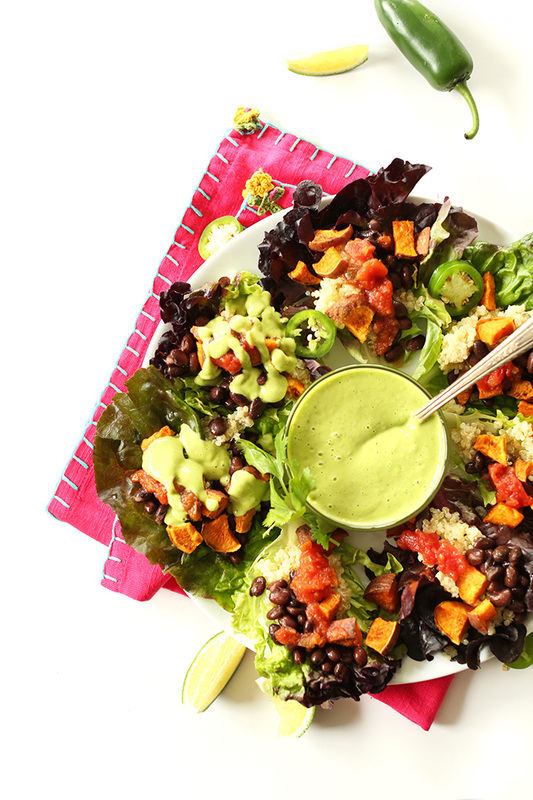 Simply arrange your lettuce on a plate and top with quinoa, black beans, roasted sweet potatoes, and a bit of the cilantro-lime dressing. John and I split these for lunch and polished the plate! 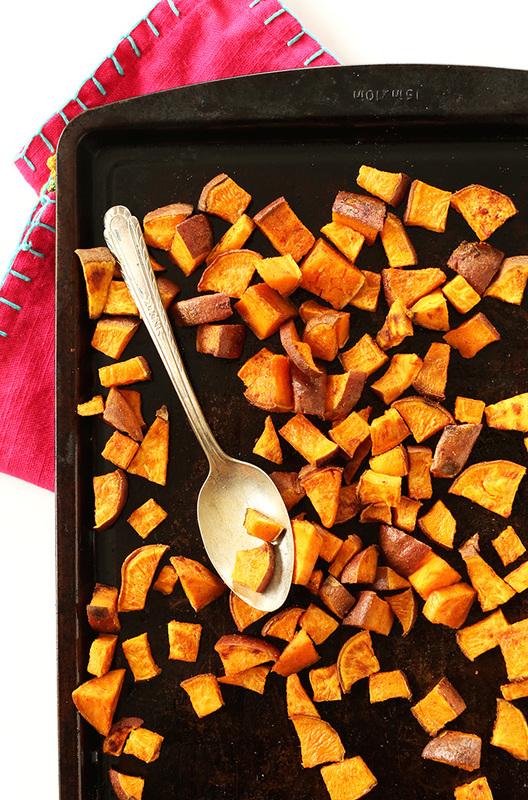 They’re so light, flavorful and healthy, yet entirely satisfying. If you have vegan or vegetarian friends, they’ll definitely love you for making these. But I think they’re filling enough to please even hearty meat eaters. If you give them a shot, let me know! Take a photo and tag it #minimalistbaker on Instagram. I’d love to see! Cheers. 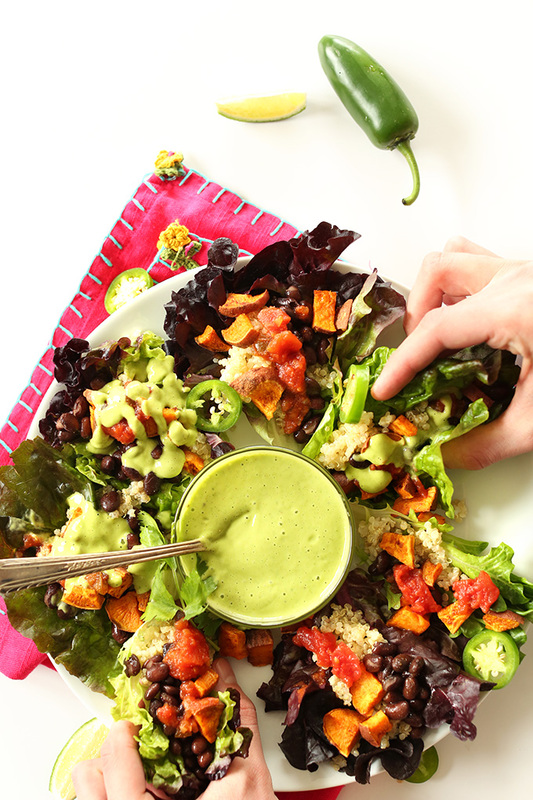 30-minute Mexican quinoa salad cups loaded with fiber, protein and healthy fats from quinoa, black beans, sweet potatoes and a creamy, vegan cilantro-lime dressing! Preheat oven to 400 degrees F (204 C) and prep sweet potatoes. Toss in a drizzle of olive oil and 1/4 tsp each cumin, cinnamon and sea salt (amounts as original recipe is written // adjust if altering batch size). Bake for 20-25 minutes or until tender and slightly golden brown. 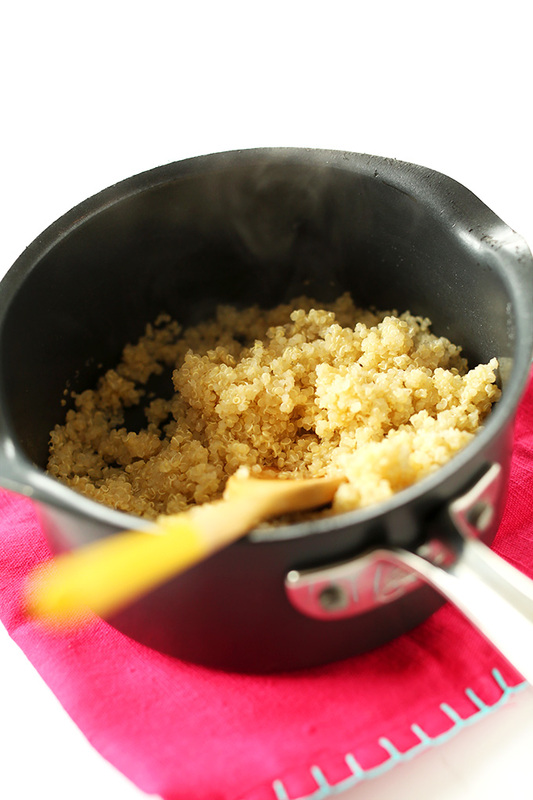 Rinse quinoa in a fine mesh strainer and place in a small saucepan over medium-high heat to toast. Stir and cook for 2-3 minutes and then add 1 1/2 cups water and stir (amount as original recipe is written // use a 1:2 ratio quinoa:water if altering batch size). Bring to a boil, then reduce heat to simmer, cover and cook for 15 minutes or until tender and the water is fully absorbed. Turn off heat and set aside. In a separate saucepan, bring black beans to a simmer over medium heat and season with 1/4 tsp each sea salt, cumin and cinnamon (amounts as original recipe is written // adjust if altering batch size). If your black beans are already salted, omit additional salt. Once bubbly and warm, turn heat to simmer/low. 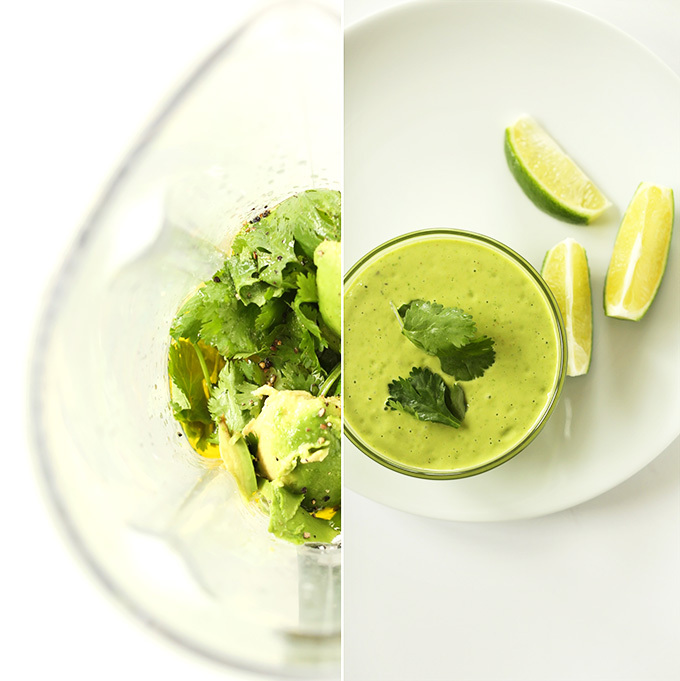 Prepare dressing by adding all ingredients (starting with 2 small or 1 large lime(s) as the original recipe is written) besides water to a blender and blending. Add water to thin and scrape down sides as needed. Taste and adjust seasonings as needed, adding more lime, salt, cumin or sweetener as desired. Transfer to serving dish. You will have leftovers, which store well in a covered container in the fridge for up to several days. Rinse and dry lettuce (or sub corn or flour tortillas) and choose the pieces that are a good “cup” shape to fill with toppings. Arrange on a serving plate and top with quinoa, black beans and sweet potatoes. You might have leftover toppings depending on how many salad cups you prepare. Leftovers keep well. Serve with dressing and any additional desired toppings, such as cilantro, salsa, chips or sliced jalapeno. *You will have leftover dressing. Great! Thanks for sharing, Lacey! Can this recipe be made oil free? if so how would I do this? I was thinking of adding a whole avocado and then for the oil portion use water? Others have omitted the oil, so you could give that a try! Hi Dana, I made the Cilantro lime avocado dressing and I think the measurements are off for the amount of limes. I used juice from 2 limes and a whole avocado and the lime flavor was overwhelming……so I added another avocado and it turned out delicious. Love it and will make it again. I used Agave for the sweetener and it was good as well. Thanks for your recipes, I am enjoying them ! Ellen P.
Ah, I bet this depends on the size of lime. I’ll see if I can clarify the quantity there! Hello, I would like to make this delicious sounding recipe but I’m wondering about the serving size. It says it is for 12 servings. I adjusted the servings to 2 to make this for my husband and I, which made the measurements very small, e.g. .08 avocado and .17 sweet potato. This doesn’t seem nearly enough food for two. Any advice is welcome, thanks! Hi Maria! It is 12 servings when made as an appetizer. I’d recommend cutting the recipe in half for two people eating it as a meal. Hope this helps! Thanks for your quick and helpful response! One more question regarding the nutrition per serving. In the posted recipe it is 282 calories and 18 g of fat for 1/12 (1 serving), meaning the whole dish is 3384 calories and 216 g of fat. I have made these 3 different times for company in the last month. Easily and delicious recipe (like all your other recipes I have tried)! The sauce is the best part!! I used collard green leaves to make them more of a wrap, since the lettuce cups were kind of messy the first time around. Thank you for sharing!! Absolutely loved this dish!!! Words really cannot justify how good this dish is. Full of flavor and extremely easy to make! Made this tonight. Used black beans instead of pintos. Awesome. Delicious! Used brown rice and leftover roasted sweet potatoes. I want to put that dressing on EVERYTHING! So good! Just made your 1 Pot Lentil Chili (seriously AMAZING!!) and am now starting this recipe. Vegan feast tonight! One question – do I drain the black beans? Some brands have quite a bit of fluid. Thanks for all your marvelous recipes! What an amazing delicious, refreshing, and filling recipe! I doubled the dressing and only used half the oil. Still yummy. Also, I didn’t make cups but just put all ingredients over a bed of romaine lettuce. I made extra sweet potatoes and quinoa which made for easy leftovers! So good!!!!!!! I don’t usually use oil in dressings. Anything I can sub for the oil in the dressing without too much compromise to the flavor? Hi! Others in the comments left the oil out, so you could try that! These sound amazing. I´m looking for another party to serve this recipe. It´s an excellent way to share with my friends, i don´t know anything about them. I’m very excited to try more recipes from this blog. Bless your blog. I’m drooling over so many recipes and can’t wait to try them. And I’m not even vegan, but this is a-happening ;-) Thanks for sharing so many of them freely here! I made this last night along with the Portabello & Butternut squash wraps. I have made quinoa several times but never really enjoyed it that much. I don’t know if it was a different brand of quinoa, or the fact that I rinsed and toasted it like the recipe indicates, but this was awesome! I was lazy and was tired of eating salad so I just mixed the quinoa, black beans, kernels from a fresh ear of corn, raw onions, cilantro all together and was in heaven~!!! it was delicious. Since I made the Portabello & Butternut squash wraps also I didn’t want to duplicate the squash ingredient. So I used my squash in the other recipe. The Avocado Dressing is the bomb!!! Loved it. OH! and the red sauce from the Portobello and Butternut Squash wraps is so good I was just eating it with a spoon! Delightful din din! Just tried this tonight (after looking for a creamy cilantro avocado dressing…shoulda known you would have my back, Dana). It was fantastic… Not a cinnamon fan but went with it and was delighted how the flavored came together. Did crush some tortilla chips on top of each lettuce wrap for a nice fortified crunch. Great recipe. This was wonderful as a salad on a bed of arugula. Used butternut squash instead of sweet potatoes as that is what I had on hand. Definitely going into our regular rotation. 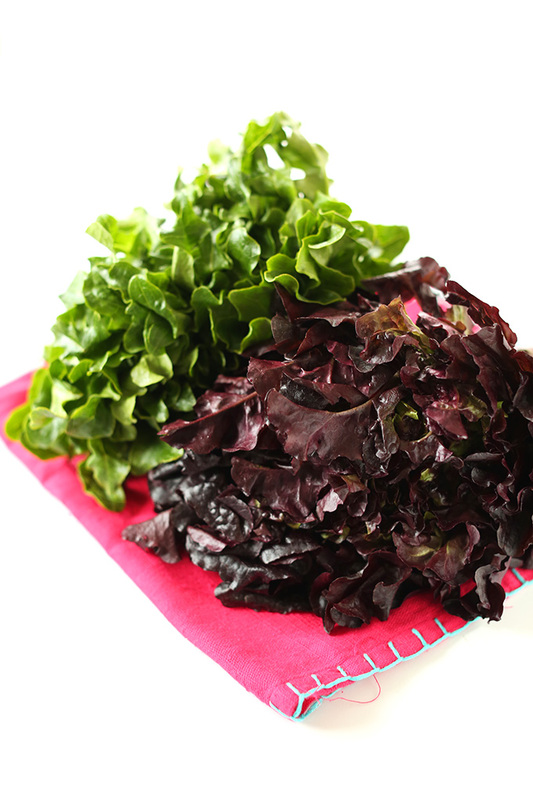 Dressing will be lovely on lots of salads, Tex mex. tacos, etc. ? these sound amazing! any idea how long this dressing lasts? i would like to try to make it ahead of time but wasn’t sure if the avocado in it would brown. Up to 4 days in the fridge! Dana, this recipe was SO good! I substituted rice for quinoa due to the over-abundance of it in my pantry and I don’t think it a difference. The taste of the cinnamon sweet potatoes and black beans mixed with the cilantro-lime dressing was wonderful. YUM! I might have been a little too over-ambitious with the romaine cups… I filled them over-capacity to the point that they were a little messy to eat. Next time I’ll just make more, smaller cups :). Thank you for sharing this, I love your blog! So great! thanks for sharing, Alexandra! This was our second dinner from your blog in the past week. 5 stars. But let me preach about dis dressing doe! Oh my damn… We’ve been searching for any and all excuses to smear that goop on every edible in our house. Carrot chips? Yup. Pizza? Fo sho… Straight up on a spoon? You know it girl! All this to say, that dressing is pro! haha, yes! So glad you liked it, Jerm! I made this tonight. I can’t wait until breakfast when I will eat some more of it. My lettuce cups weren’t cooperating, so I just made it into a salad. Awesome recipe!! Whoop! Glad you liked them! Thanks for sharing, Liz! I made these for Meatless Monday lunch at my work (with just a small variation using brown rice instead of quinoa) and they were such a hit! Especially that dressing…mmm! I have been enjoying your recipes. I have even tried eating a few of them! So good! I would like to purchase your recipe collection. Would it be possible for you to make it available on kindle readers? I am traveling in my RV with my husband, cell phone and kindle. Most of your recipes are perfect for RVers. A lot of us leave laptops at home. Thanks, and I will continue looking for new ideas from you. I searched for a non-dairy cilantro dressing and found yours. It’s so good- I drink it when no one’s looking. Thank you! I am allergic to Avocados, is there another substitute? I didn’t make the salad, but I made the dressing for a salad I made when I had some friends over. I used agave nectar instead of honey. It was a hit with the crowd! Made this tonight as a salad instead of the cups. It is amazing. 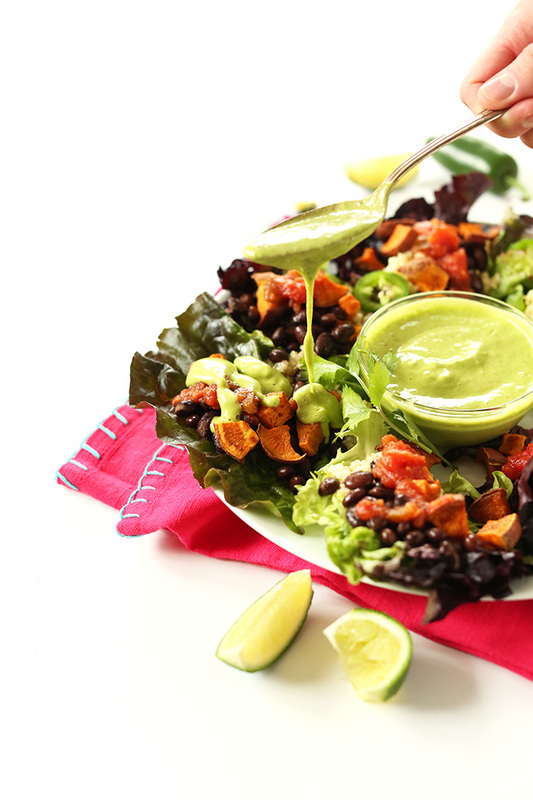 The dressing is similar to that yummy green sauce you get with Peruvian Chicken, but way easier and a lot healthier. made this as burritos and it was the awesomest shxx ever. this was seriously so yummy! The cumin/cinnamon combo is perfect! I have an avocado allergy so I skipped the dip and just used some Siracha and salsa. TO DIE FOR! I will be making this again. Thank you for posting this recipe, it is exactly what I was looking for! I’ve been trying to recreate the lime cilantro dressing from Calexico, a restaurant in NYC. Beautiful blog, also! I’m very excited to try more. I am so excited to give these a try later this week! That cilantro lime dressing looks to die for! Yay! Glad you enjoyed it. Thanks for sharing, Anya! Darn it – forgot to rate it – 5 stars! Just found your website and this recipe yesterday. I made this last night for our guest who is vegan. It was amazing! Everyone went back for seconds. I added more veggies to the plate, tomatoes, onions, etc., it was outstanding. My boyfriend wanted the cold leftovers in his lunch – um, but there weren’t any leftovers. I will definitely be back for more recipes! I’m a big fan of sweet potato and black beans with cumin…but I made this and would suggest some adjustments: first of all, way more spices (like cumin, but also try coriander and even a little curry powder), but less cinnamon and add minced garlic to the beans at least. Also, I’d make sure you’re clear on what “juice of 3-4 small limes” means – I used a hand-juicer tool instead of squeezing by hand and the sauce ended up being REEEEALLY limey, I think more than was intended. Otherwise great idea! First of all, I have to tell you that I am LOVING all of your recipes so far! I made the chocolate chip oatmeal banana pancakes again this morning. My kids think I’m a genius. Your carrot cake pancakes are also delicious! This past weekend I made your peanut butter cup pie, and OH MY WORD…it was sooooo good. So glad you and your family have been enjoying the recipes! And that your kids think you’re a genius. Score. For this particular dressing, I would sub silken tofu or soaked cashews (drained). Hope that helps! I’m making your recipe in a couple days, so thought I’d reread it to see what I needed. Found your nickname for the salsa is the same as mine…Green Gold! My version of a favorite Austin restaurant’s salsa might just knock yer socks off in the heat dept., but it sure is good. Hi! I turned this into a salad because I had salad mix, versus actual lettuce leaves. I never use leftover avocado, so I used a whole avocado and left out the oil in the dressing. It was all so good, so delicious, thanks!! This was excellent! I grilled some corn, sliced it off the cob, and added it to the salad (since I love black beans and corn together), and it was delicious. My particular boyfriend who is normally skeptical when I make vegan dinners even loved it and went back for a second helping. Thank you for posting! Yay! So glad you enjoyed it, Melanie. Yum! That dressing looks amazing. I just created a Mexican hash recipe and that dressing sounds like it would be perfect on a poached egg with the hash. Almost like a Mexican hollandaise! 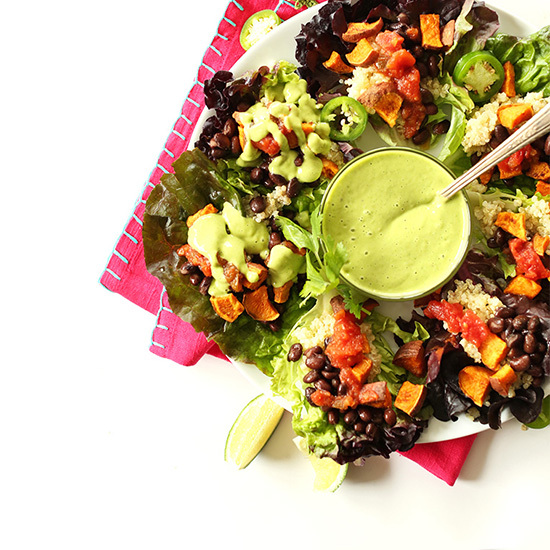 Love this salad recipe, the dressing sounds amazing with the avocado and cilantro. Good morning Dana & John, I am relatively new to your blog/website and wanted to tell you how much I look forward to your messages and recipes, thank you! Today is yet another beautiful example of eating the rainbow full of eye appeal (gorgeous pictures BTW) which lead me to want to make this for dinner tonight. I will swap out the regular black beans for black soybeans which are low in calories, carbohydrates and sugar but high in fiber, better for those with Diabetes. The rest will be as listed. Not only is this a feast for the eye, but it’s fun! Best finger food since olives!! Thank you for inspiring others to eat healthy. You two make a fantastic creative team! Thanks Marcia! So glad you enjoyed these. Thanks for sharing your experience! Made this for dinner last night, and the hubs and I loved it!! We just made it into a big salad instead of lettuce cups, and it may just have to go into our weekly rotation. Yum!!! Lovely! So glad you both enjoyed it so much. A big salad is a much more practical application. Thanks for sharing, Andrea! You guys, this sounds like the perfect dinner. Every dinner. I could eat this forever. SO trying this! And your photos are just phenomenal, as always. Thanks Trish! Let me know if you do! Great idea! That dressing is my favorite part about the whole dish! Holy smokes! I could eat these any time of day. Yum! Can’t wait to try this… anything in a lettuce cup is a big hit around here. Go figure! The flavors sound heavenly! ’tis! Hope you like it, Meredith! These look so delicious! I make something similar, a vegan buritto bowl, but serving them in little cups would be the perfect appetizer! this looks so healthy and refreshing!